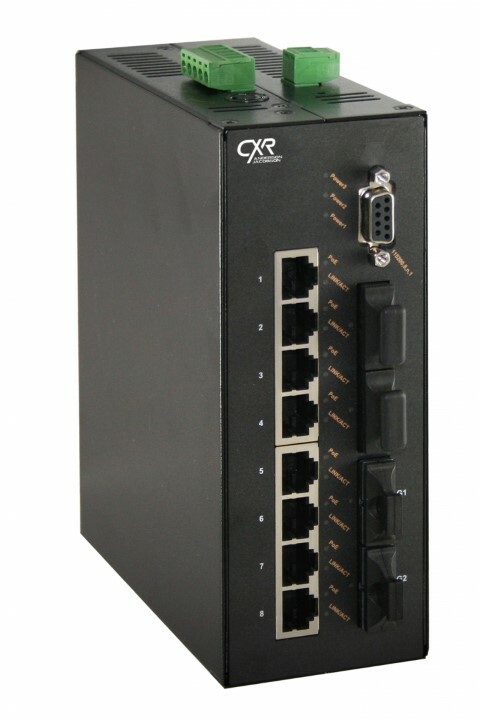 SWMD-H-8TPS-2GX is an access Ethernet switch with 8 Fast Ethernet ports and two Gigabit Ethernet uplink ports. Gigabit Ethernet ports are either 10/100/1000BaseT or optical SFP interfaces. It delivers the 802.3af/at POE supply with a total power budget of 180 W.
SWMD-H-8TPS-2GX is a ruggedized DIN rail product with extended temperature range from -40 to +75 °C. It is qualified for its immunity to chocks and vibrations as well as insdustrial electromagnetic environments. Its size, dual 48 Vdc power inputs, industrial design and its rich feature set, make it a polyvalent switch to serve all type of enterprise and industry requirements. SWMD-H-8TPS-2GX embeds a full set of protocols to implement an Ethernet network and manage application and user traffics. Critical trunks may be redundant with STP/RSTP/MSTP, and access security is based on authentication. Traffics are isolated into 802.1Q VLAN's. IGMP-Snooping enables video streaming applications. SWMD-H-8TPS-2GX provides controls and statistics on the POE supply to the Ethernet devices. Protection circuits avoid any over-consumption or abnormal temperature increase. The total power budget is 180 W which is correponds to 4 ports at 30 W and 4 ports at 15 W.
SWMD-H-8TPS-2GX is controlled through a CLI or a user friendly web interface. It is a DIN rail compact product with two 48 Vdc power inputs.